Whilst seventies style is my obsession, it's not always about the classic rock'n'roll vibes. You can't forget about the bohemian style of the late sixties / seventies, and this jacket just screams that era. 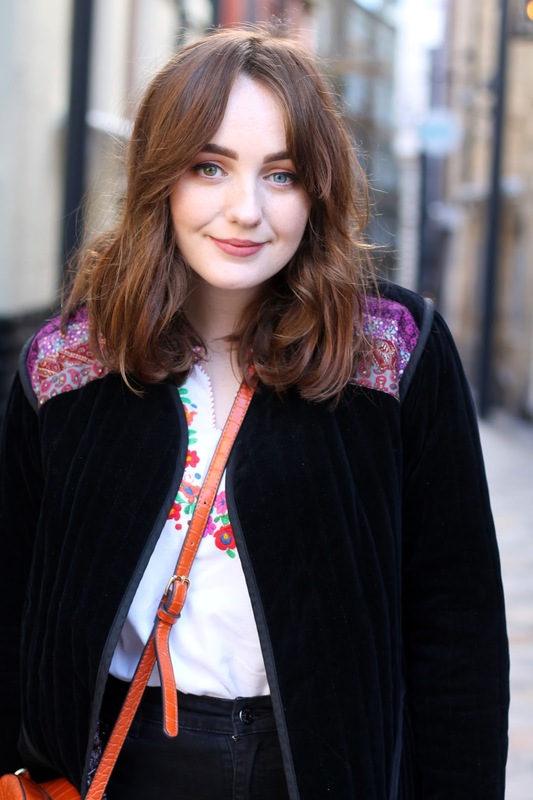 After getting this quilted velvet jacket from Rokit Vintage last week, I've been thinking of ways to style it that won't make me look like I'm on my way to a fancy dress party. 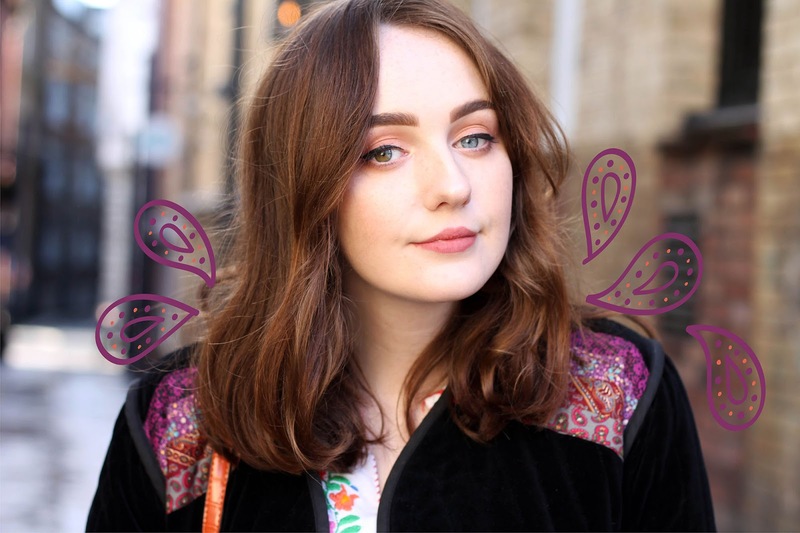 This is a big risk when it comes to boho fashion, as it's just SO easy to look like Coachella threw up on you, but I'm here to talk about how to style a bohemian jacket, the modern way. First up, let's talk about the jacket itself. This deep black jacket is lined with a gorgeous paisley cotton, which to be honest makes me feel a tiny bit like George Harrison, so we're already onto a winner. Then there are these appliqué patches of different paisley designs across the shoulders, bringing a pop of colour. This makes me feel like this vintage jacket could work for day or night, looking great with ~jeans and a nice top~ or thrown over a t-shirt and denim shorts come summertime. I'm already looking forward to festival style, even if I'm not planning any camping festivals this year. As you can see, I'm kind of getting ahead of myself with these sandals, but this outfit would look just as good paired with some ankle boots. 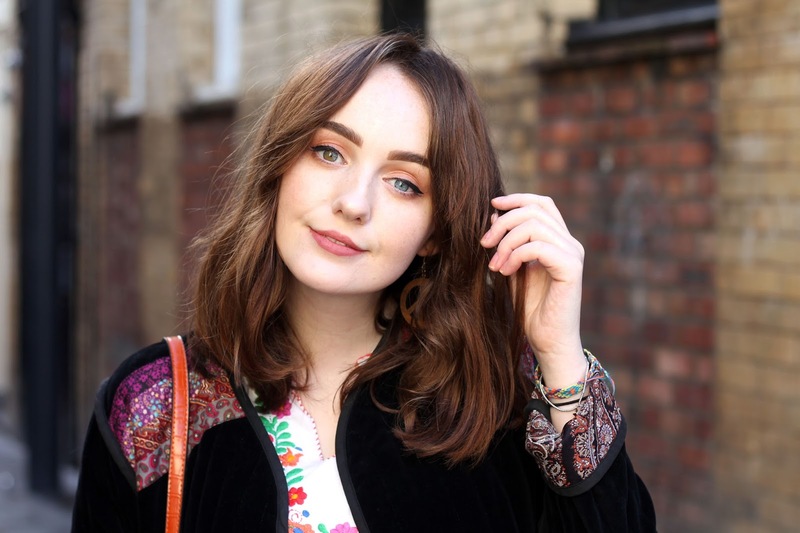 Here, I've styled my Rokit Vintage jacket* with a folk style vintage top, which could have been going overboard, but as both the jacket and top are fairly subtle (or at least I think so), it kind of works. 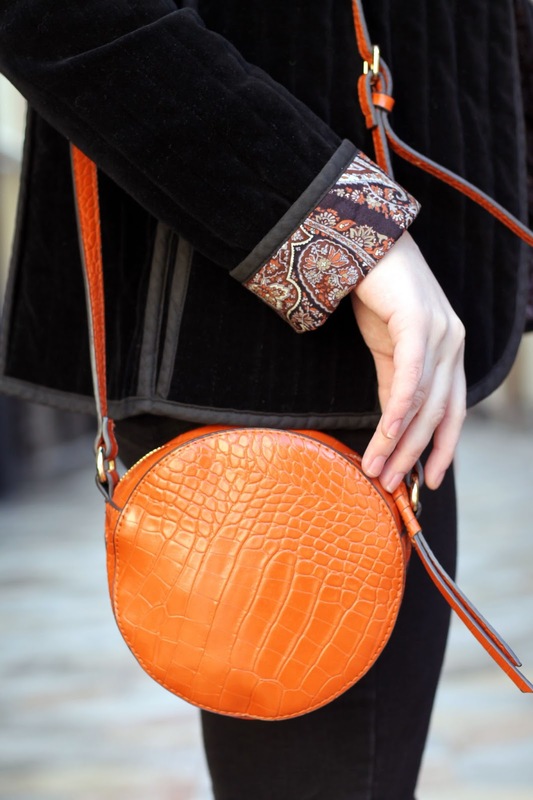 There are small hints of orange in the embroidery and paisley hints on the jacket, so I've made a theme and ran with it with these flat orange sandals and round orange cross body bag. Whenever I share this bag people become obsessed with it, so make sure to get it before it goes out of stock! Pairing vintage finds with more modern or basic pieces is always a winning formula if you ask me. I mean hey, if you want to go head-to-toe vintage, go for it! These are just tips for people who want to take elements of vintage and bohemian style and put them into their existing wardrobe. Some pieces you might already have in your collection that work well with bohemian style outfits are turtleneck jumpers, anything with flared sleeves, floral print, suede and anything with fringing. Bonus points for fringing, because it screams the SS18 western trend! I'm loving the look of this jacket styled with these cropped jeans, some blue jeans would look great, too. Maybe my beloved ASOS farleigh jeans? You can read all about why I'm a fan of those here. Ooh, or a bright orange or purple mini skirt and ankle boots, that'd be a fab outfit for a night out with the girls, right? I'm sure as the weather gets warmer you'll be seeing much more of this jacket on the blog and on my Instagram. And remember, not every piece of clothing you wear has to be bohemian, it can just have small things in common, like a print or a colour scheme, to look put together rather than thrown together in a festival tent (although, to be fair, those are some great looks too). After styling this outfit, I'm desperate to find more bohemian style gems like this one. Rokit Vintage have tonnes of items, from jackets to bags and everything in between. In fact, there's something else exciting coming from Rokit Vintage in a few days, so make sure to follow me on Instagram so you don't miss it! *Items marked with (*) are gifted. All opinions are my own. This post also contains affiliate links. Another BANGING outfit Allie! When wearing vintage pieces it can sometimes end up looking a bit like a costume, but you've brought it right into 2018 beautifully. I wish there was a way for its previous owner to see it now!